Mene's sculpture Whinny of the Stallion, The figure of horse standing against rail fence,is one of his most famous works and was the basis for several other sculptures. From The Whinny, Mene produced the Arab Stallion Saddled, Cheval Libre, and this fine model of an Arab Mare with Saddle and Gun. 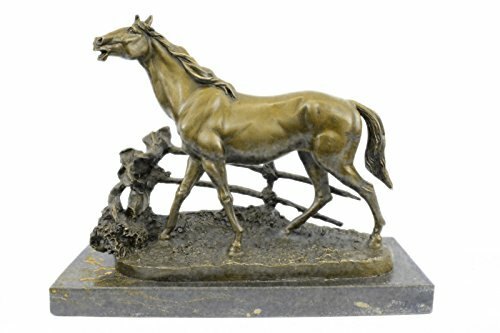 This 100% bronze handmade sculpture was cast using the Lost wax Method. It is mounted on a square black marble base and signed P.J Mene. Enjoy the workmanship, details and the elegance for generations. Real Hot Cast Bronze Sculpture. If you have any questions about this product by Bronzioni, contact us by completing and submitting the form below. If you are looking for a specif part number, please include it with your message.